In fact it is so simple that in the first look some people are unable to believe that it's so much feature packed. If we could embed it on this slider, you could embed it anywhere !! We have it all !! We have it here !! We have it now !! These features will make you wonder - "Why was I even looking at the other platforms??" Cross Device Support with various output container and protocol options. All handled automatically for you. We handle the transcoding behind the curtains so that you don't have to worry about the right formats & deliver via CloudFront. Not only we support all major Ad Tags, we also help you monetize and optimize the content to its potential. Share videos right from the Dashboard to social platforms and sync directly with your YouTube account. 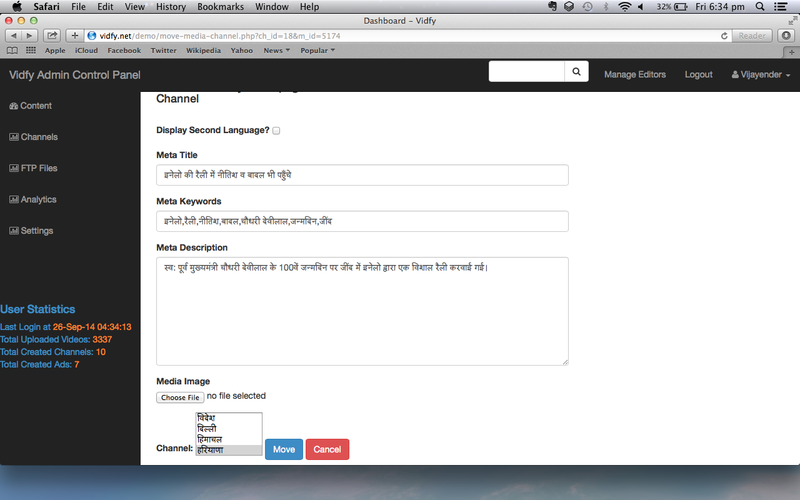 We let you store video meta data in 2 languages to help you cater to your local audience as well as the World. We provide you with a Video Portal mapped to your Vidfy account to get you started in minutes. Although a thumbnail is generated for each video, but some videos need that extra detailing with a custom thumbnail. Publish the video on your website by just pasting the HTML Embed code or fetch the code from API for a dynamic experience. Its as simple as Upload-Categorize-Publish !! Upload it and Use it. You don't have to worry about the technicalities of Video Delivery. You can upload your video with just a single click. Its just like uploading your profile pic on Facebook. 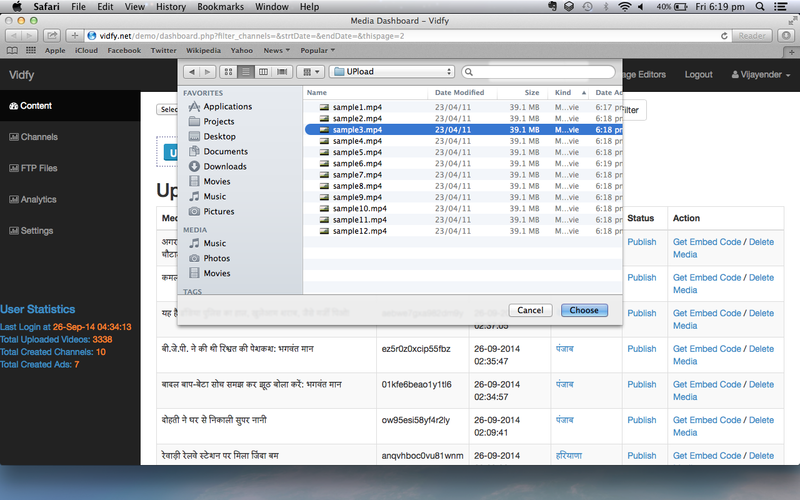 But don't worry we have bulk uploads via FTP too !! 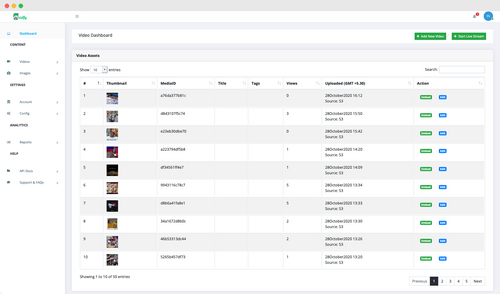 Add meta data and categorize your video into the respective channel. 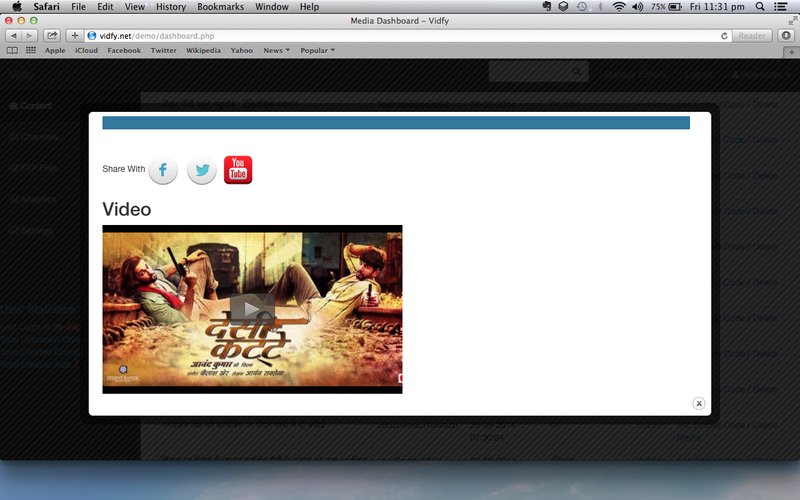 This will map the video on your Video Portal and will start showing up in the API too !! You can either copy the embed code or fetch the embed code from the API. And you are ready to share your story with the World !! Awesome plans that wont break the bank. Choose a plan and upgrade as you grow. We have tried to put together the most frequent questions asked. Yes, APIs are available for account level, category level and media level details & as soon as you map a video to a category it gets published automatically on the API so that you dont have to place the embed codes manually. Yes, by default we provide presets that transcode the video in web and mobile ready formats. In case you want to define custom formats, you can do that as well. Can I put my logo on the player? Yes, player customization is possible in the Enterprise plan. You can change player theme as well as apply logo watermark on a fixed position on the player. We support pre, post and mid roll advertisements on the major ad tag formats like VAST, VPAID and Google IMA. We support both linear and non-linear ad formats. The player has both HTML5 as well as Flash support. You can define the default mode for the player and the other mode becomes a fallback option. We give you the option to connect your AWS account while signing up so you use & pay for the storage (S3) and delivery (CloudFront) directly in your AWS account while we charge the platform fee mentioned above for video workflow management thus giving you a transparent view of usage. We are a group of techies with varied experiences in Video Streaming, Device Compatibility, Tech Architecture Design & System Optimization. We saw a lack of transparency in other Online Video Platforms and came up with our own to charge customers what we truely deliver & the rest (storage & delivery) best left to partners like AWS.